Hyperledger just announced a new blockchain project focus on building supply chain solutions. Hyperledger just announced a new blockchain project focuses on building supply chain solutions. 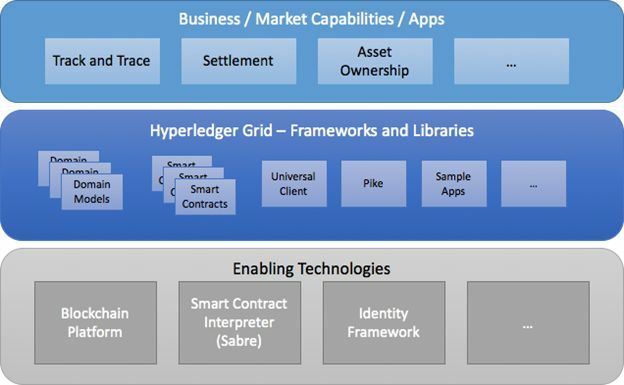 The project name is Hyperledger Grid. The project will provide a valuable and more accessible functionality, tools, and modules for distributed supply chain usages. The project currently in its incubation state, will join the Hyperledger blockchain projects family that includes popular blockchain projects such as Hyperledger Fabric and Hyperledger Sawtooth. Supply Chain is a solution-driven project, not a blockchain implementation. This means that blockchain is an enabler rather than the driver of the project. Supply Chain will be a multi-layered ecosystem of technologies and frameworks that are able to work together. Users will select only the relevant components for their industry or deployment model. The initial basis for this interoperation is in the smart contract layer for the existing track and trace code which has been implemented in Rust/WASM. Components are intended to be reusable but also prescriptive. By prescriptive we mean that this architecture will require certain formats or patterns. By contrast, platforms like Sawtooth do not bias development towards a particular language, serialization mechanism, etc. For example, the track and trace application should be adoptable by any industry, but the pattern for interaction with underlying blockchain persistence is fixed. The latter assists usability by not creating too many esoteric options for users and developers to pine. Furthermore DLTs typically provide abstract key:value storage and leave asset models to the definition of developers. This is another area where this project will provide higher level assistance to app developers. Supply chains have common composition and traceability patterns that should be enabled by asset classes provided by the library.